We would like to draw the attention on a delicate matter that has hit the news and social media today. Reference is being made for the public announcement made by the DOI earlier today on Lamb Brand Sultanas. Lamb Brand is a renowned brand by C. Cini Mfg. Ltd and thanks for its ISO & HACCP implementation and Certification, it has the ability to trace all products; where they have been sold and in what quantity. Lamb Brand continuously tries to acquire the best field produce from around the world and constantly improves the sourcing system. The General Public needs to be aware that all the products in question have been collected from all retail outlets, however some products might have already reached the consumer. Should you have in possession the Lamb Brand Sultana in picture with the Expiry date 17/11/2017 you are kindly requested to return it to the place of purchase for an exchange or refund. Having said and done all this we would like to explain this issue in more detail and calm any consumers that might have already consumed the mentioned product. - Ochratoxin A is a type of fungus found in raw food, levels of Ochratoxin A can increase over time if food is not stored well. High temperatures and humid conditions make way for this fungi to multiply and level to rise. The Ochratoxin A level can vary within the same batch depending on it’s storage conditions. 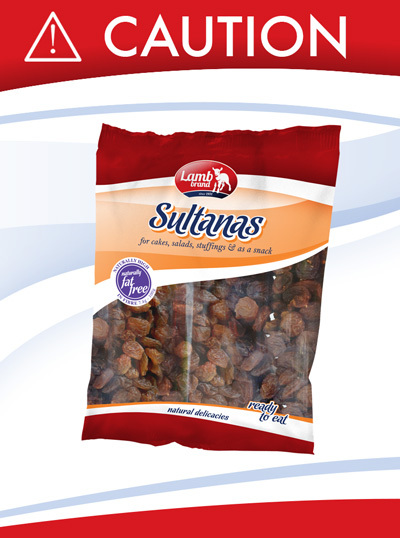 - The batch of Lamb Brand Sultana in question has been tested and passed all relevant certification before being imported in Malta and on arrival the local authorities had released it into the local market according to EU standards, but as explained above the Ochratoxin A level has increased by time due to high temperatures and improper storage conditions. How does Ochratoxin A effect human health? Ochratoxin A is a potent nephrotoxin and is reported to cause acute and chronic effects in the kidneys of all mammalian species tested. The sensitivity of different species varies, but a level of 200 μg/kg (micrograms/kg) in feed over three months is sufficient to cause acute damage to the kidneys tested on pigs and rats. So far there are NO documented cases of acute Ochratoxin A toxicity in humans till today.